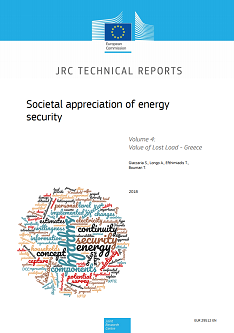 This report presents the results of a study on the Value of Lost Load (VoLL) in Greece for various scenarios of interruptions of power supply. The VoLL is the value of unserved energy, and quantifies the value of damages perceived by energy users, in case of a blackout. The VoLL is used as a proxy of the economic value of reliability or alternatively of the social costs of power outages. The study involved two surveys: one on a random sample of 1500 households, completed via web and telephone interviews, and a second on a random sample of 750 non-residential customers included industrial, commercial and small medium enterprises participating in telephone interviews. VoLL is a latent unobservable variable and is influenced by characteristics of the consumers. In the literature on the monetary valuation of VoLL, a common approach is to consider the variation in well-being of consumers comparing the two conditions (with/without electricity supply). The value of the damage, in this methodological framework, is represented by the consumers' willingness-to-pay (WTP) to avoid the interruptions, and by the willingness-to-accept (WTA) compensations for the inconveniences of the interruptions.